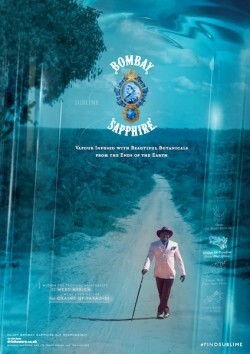 Gintime editor Geraldine Coates has a sneak preview of the new Bombay Sapphire advertising. I used to write a regular column for a drinks magazine reviewing drinks advertising and marketing. (The magazine will remain nameless as we parted company over a difference in opinion on what constituted journalistic integrity/genuine editorial and what the advertising sales team wanted to see in that month’s issue). 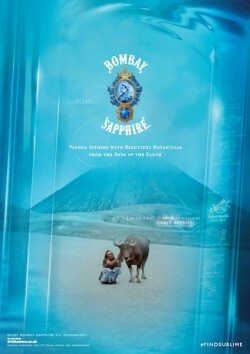 But, how delighted would I have been when the new Bombay Sapphire Sublime Campaign hit my desk because it’s not often one can actually wax lyrical about an advertising campaign of any kind never mind for a drinks brand especially given that drinks marketing is so hedged around with regulation that creative options are massively limited. 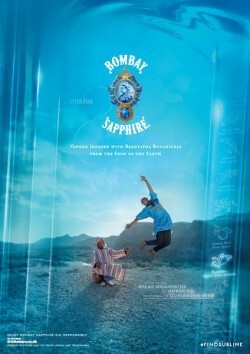 The new global, multi-million pound Sublime campaign from Bombay Sapphire covers social media, PR, outdoor, print, cinema and television. 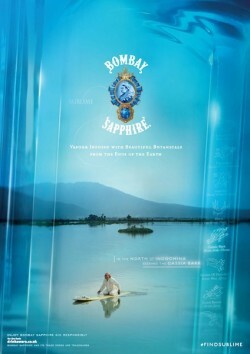 Its stated aim is ‘to drive demand and advocacy through communications that compellingly capture the unique qualities of Bombay Sapphire’. We would think of these as the Bombay Sapphire USPs ie the 10 botanicals from locations of extraordinary beauty, the vapour infusion process, its distinctive blue bottle and the beauty of the distillery and glasshouses at Laverstoke Mill. The new brand film, directed by award-winning Laurence Dunmore, takes the viewer on a journey through four of the locations where Bombay Sapphire sources the 10 botanicals that go into the gin: Morocco (coriander seeds), Java (cubeb berries), West Africa (grains of paradise) and Indochina (cassia bark). Watch it here. It’s shot from the point of view of a man holding the iconic blue bottle and is intended to capture the essence of the locations, relationships and botanicals that evoke Bombay Sapphire’s pursuit of ‘Sublime Beauty’. The film marks the launch of the campaign and will run in cinemas from today (Friday, 30 January). Accompanying it is new ‘Sublime’ imagery taken at four different botanical locations that will be the basis of the press and outdoor work. Beautifully shot and highly evocative, the four executions are accompanies by the line ‘Vapour Infused with Beautiful Botanicals from the Ends of the Earth’ all washed in he instantly recognisable Bombay blue. Great stuff, does what it says on the tin, and it will be good to see how this strong, coherent theme is going to be implemented on all the different platforms. Currently there is further support for the new campaign on Bombay Sapphire’s social media channels with the #FindSublime campaign hashtag.